Mercury two-stroke outboard motors use an oil-fuel mixing system to provide mixing of two-stroke lubricating oil with the gasoline. 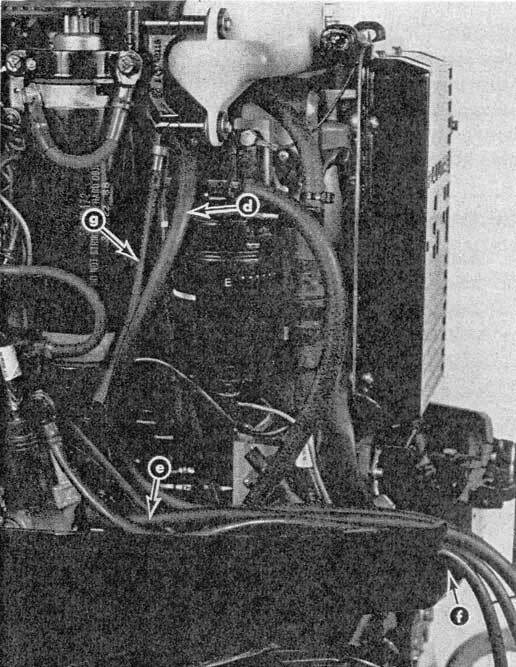 Details of the implementation of this system are provided in this article, which reproduces several pages from a Mercury Service Manual, c.1989. 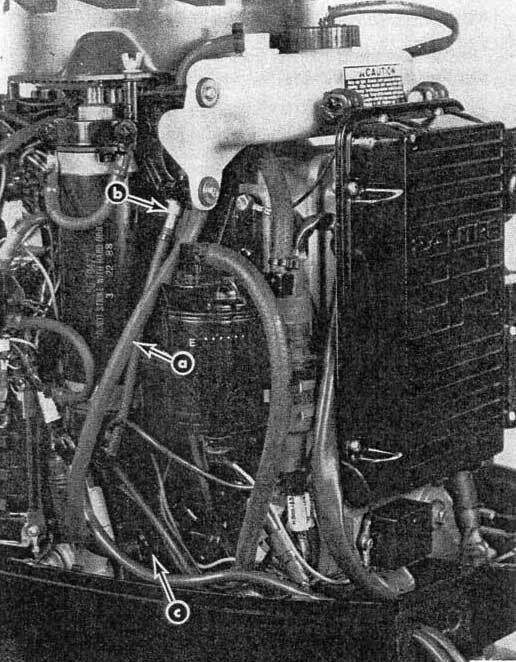 The service manual contains a great deal of additional information, and owners of a Mercury outboard with oil-gasoline mixing should obtain the Mercury Service Manual for their engine to have a complete understanding of the system. This brief excerpt is presented in order to provide a point of reference for comparison of the Mercury system of oil mixing with other techniques used to accomplish mixing of oil and gasoline in two-cycle outboard motors. Mercury frequently uses the term "injection" to describe their method of mixing oil and gasoline. There is no oil injection in the modern sense of two-cycle engine oiling. 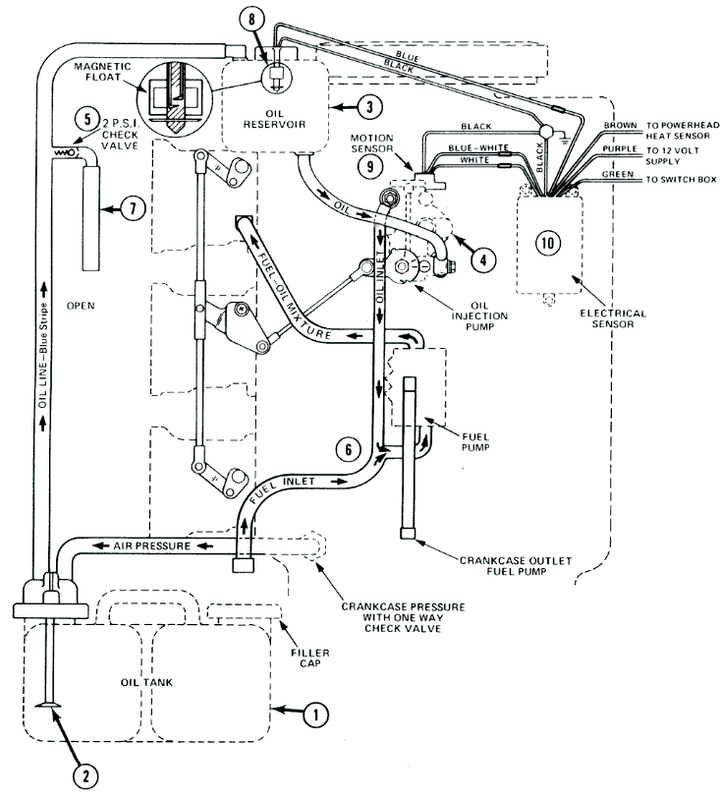 The oil and gasoline in this system are simply mixed in a T-connection on the suction side of the fuel pump, prior to being inducted into the air stream that leads to the inlet port of the combustion chamber. The result is the same as if the oil and gasoline were pre-mixed in a tank, except there is an advantage that the mixing ratio can be varied according to engine operating speed by linking the pump to the throttle position levers. The oil [mixing] system delivers oil mixture on engine demand, from 100 to 1 at idle to 50 to 1 at wide open throttle. The remote oil tank can be removed from the boat for easy refilling. The remote tank holds enough oil for over 150 gallons of fuel at wide open throttle. The remote tank supplies the oil reservoir mounted on the engine. The oil reservoir feeds the oil pump and contains enough oil for at least 30 minutes of full throttle running after the remote tank is empty. The warning horn will sound if the oil level in the oil reservoir is low. The oil [mixing] pump feeds oil into the fuel just before the fuel pump. The oil [mixing] pump is driven by the crankshaft and is connected to the throttle linkage for metering the varied flow of oil per engine RPM. 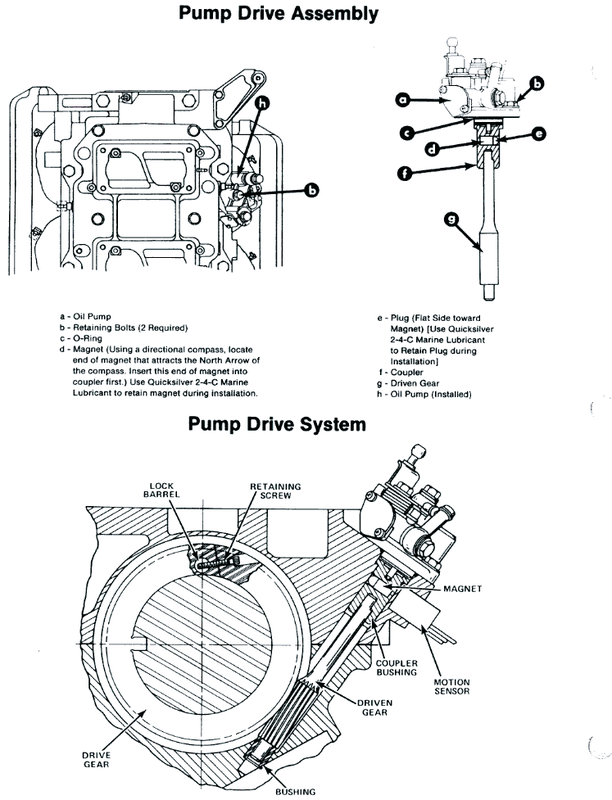 The motion sensor will sound the warning horn if the drive system for the [oil] pump becomes inoperative. Make sure fill cap gaskets are in place and caps are tight on engine oil reservoir and remote oil tank. Mix a gasoline and oil mixture of 50:1 in the remote fuel tank during the initial break-in of the engine. Be certain the warning horn is installed and is operational. Refer to Instrument and Warning Horn installation. Each time the key switch is turned from the "off" to "on" position (engine not running), the warning horn will sound momentarily. This tells you the warning system for the oil...system is functional and the warning horn is operational. If warning horn does not sound or horn stays on when key is turned to the "ON" position, refer to oil [system] troubleshooting chart following to correct the problem. Operate engine following the break-in procedure outlined in the Operation and Maintenance manual. If the warning horn should sound an intermittent "beep--beep--beep" during operation, this indicates a problem occurred in the oil [mixing] system. Refer to the troubleshooting following to correct the problem. After engine has been run for a short time, open cowl and check that no oil is leaking out of the engine oil reservoir fill cap. Numbers refer to key numbers in drawing below. REMOTE OIL TANK--Holds three gallons of oil. The tank is pressurized thus forcing oil up the outlet hose to the oil reservoir on the engine. OIL PICK UP TUBE--A filter screen is located in end of tube to prevent dirt or other particles from entering the system. OIL RESERVOIR--The oil reservoir feeds the oil pump and contains enough oil for at least 30 minutes of full throttle running after the remote tank is empty. The warning horn will sound if the oil level in the oil reservoir is low. OIL PUMP--the pump is driven off the crankshaft. See illustration on Page 4 (follows). The oil pump is a variable metering pump. At idle the pump will meter the oil at approximately 100 to 1 gasoline to oil ratio and at WOT, 50 to 1 ratio. 2-PSI CHECK VALVE--If oil flow to reservoir is obstructed and oil pump continues to pump oil, the 2-PSI valve will open to allow air to enter reservoir to prevent a vacuum. 2-PSI CHECK VALVE--This valve prevents gasoline from being forced into the oil lines. VENT HOSE--Hose is only used to keep check valve clean. Other end of hose is not connected. LOW OIL (FLOAT) SENSOR--If oil level drops in oil reservoir, the sensor will signal the warning module to sound the warning horn. MOTION SENSOR--Senses the rotation of the oil pump drive system. If the drive system for the oil pump becomes inoperative, the sensor will signal the warning module to sound the warning horn. Sounds the warning horn briefly when key switch is turned on, to indicate that the system is operational. While engine is running, the module continuously monitors the rotation of the drive system for the oil pump picking up pulses from the motion sensor. If drive system becomes inoperative, the module will sound the warning. If oil level drops in the engine oil reservoir, the low oil (float) sensor will signal the module to sound the warning horn. CAUTION--Be careful not to get dirt or other contamination in tanks, hoses, or other components of the oil [mixing] system during installation. CAUTION--Engines with oil [mixing] must be run on a fuel mixture of 50:1 for the first 30 gallons of fuel. Refer to engine break-in procedure in the Operation and Maintenance Manual. CAUTION--If an electric fuel pump is to be used on engines with oil [mixing], the fuel pressure at the engine must not exceed 2-PSIG. If necessary, install a pressure regulator between electric fuel pump and engine and set a 2-PSIG maximum. The remote oil tank should be installed in an area in the boat where there is access for unlatching the quick disconnect and removing the tank for refilling or in an area where it will be possible to remove the filler cap and add oil without removing the tank. In either case the tank should be restrained to keep it from moving around, causing possible damage. An acceptable means of restraining the tank would be the use of eye bolts and an elastic strap about the midsection of the tank, Take care that any metal hooks do not puncture the tank. Keep in mind when installing in tight areas that this tank will be under pressure when the engine is operating and will expand slightly. Oil hoses when routed through engine well must be able to extend to the hose fittings on engine. Oil hoses must be arranged so they cannot become pinched, kinked, sharply bent, or stretched during operation of the outboard. NOTE: An oil hose extension kit (41729A3) is available for the remote oil tank. Remove (and discard) shipping hose which is connected between Tee fitting and pulse fitting. NOTE: Use care when removing shipping hose, as hose may contain oil. Route remote oil tank hoses to starboard side of engine. Install oil hose (with blue stripe) to Tee fitting on engine, as shown. Secure with Sta-Strap. 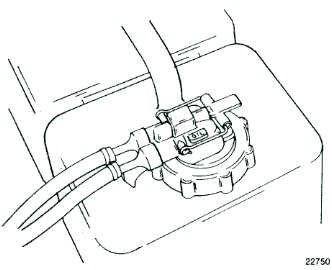 Install other hose to pulse fitting, as shown. Secure with Sta-Strap. Route oil hoses through wire clamp. Hoses will be secured with wire clamp after remote control wiring harness installation. NOTE: Hose (G) is a vent hose for Tee fitting and does not get connected. Quicksilver 2-Cycle Outboard Oil is recommended for this oil mixing system. In an emergency, when Quicksilver oil is not available, substitute a high quality 2-cycle oil that is intended for outboard use and meets BIA rating TC-W, shown on the oil container. BIA rating TC-W is the Boating Industry Association's designation for approved 2-cycle water-cooled outboard oils. Fill remote oil tank to the 3-gallon mark with oil. Re-tighten fill cap. Remove fill cap from the engine reservoir tank and fill the tank with oil. Re-tighten fill cap. Loosen (1/2-turn) the engine reservoir tank fill cap. Run the engine until air from inside the oil inlet hose has been purged out of the reservoir and oil starts to flow out of reservoir tank. Re-tighten cap. CAUTION--Be certain that all reservoir and remote oil tank caps are installed tightly. An air leak on the remote oil tank cap will prevent oil from moving from the remote oil tank to the oil reservoir. An air leak at the engine reservoir will cause oil spillage. With engine not running, place a shop towel below the oil [mixing] pump. Loosen bleed screw three to four turns and allow oil to flow from bleed hole. Re-tighten bleed screw. This procedure allows the pump to fill with oil. 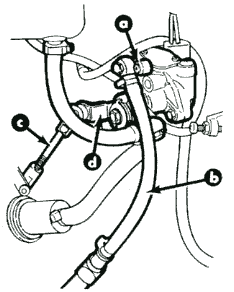 Any air bubbles in outlet hose in most cases will be purged out of the system during operation of the engine. NOTE: If air bubbles persist, they can be purged out of the hose by removing link rod and rotating the pump air full clockwise while operating engine at 1,000 to 1,500-RPM. 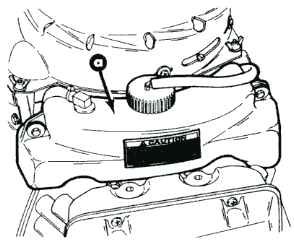 If necessary, gently pinch the fuel line between the remote fuel line connector and the oil pump Tee fitting. This will cause the fuel pump to provide a partial vacuum which will aid in removal of the air. Reinstall link rod. 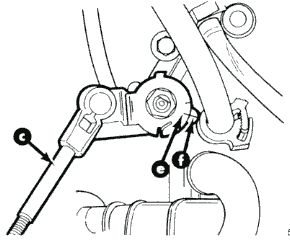 When carburetor linkage is at idle position, alignment mark on oil mixer arm should be in-line with mark on casting as shown. If necessary, adjust link rod. Make sure fill cap gaskets or O-rings are in place and caps are tight on engine reservoir tank and remote oil tank. Make sure a remote gasoline and oil mixture of 50:1 is used during the initial break-in of the engine or after extended storage. Be certain the warning horn is operational. Each time the key switch is turned from the OFF to ON position (engine not running) the warning horn will sound momentarily. This tells you the warning system for the oil system is functional and the warning horn is operational. If warning horn does not sound or horn stays on when key is turned to the ON position, refer to oil system trouble shooting chart following to correct the problem. The oil [system] warning sound is an intermittent BEEP BEEP BEEP, etc. The overheat warning sound is a continuous BEEP (not intermittent). Operate engine following the break-in procedure outlined in the Operation and Maintenance Manual. If warning horn should sound an intermittent BEEP BEEP BEEP during operation, this indicates a problem occurred in the oil [mixing] system. Refer to troubleshooting following, to correct the problem. After engine has been run for a short time, open cowl and check that no oil is leaking out of engine oil reservoir fill cap. A Quicksilver Commander Series Side Mount Remote Control equipped with a warning horn must be used with this outboard. This warning horn is necessary for both the oil [mixing] warning system and the engine overheat warning system. A Quicksilver Ignition Key/Choke Assembly equipped with a warning horn must be used with this outboard. The warning horn is necessary for both the oil [mixing] warning system and the engine overheat warning system. This article first appeared March 18, 2006.